In c# multi-level inheritance is possible but multiple inheritance is not possible because it will make code more complex. In case if you to implement multiple inheritance in your application we can achieve that by using interfaces. We will see how to achieve multiple inheritance in c# using interfaces with example. Following is the example of implementing multiple inheritance in c# applications using interface. Following is the result of multiple inheritance example. 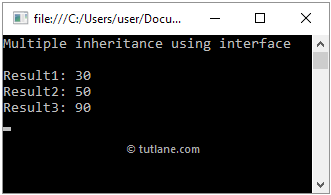 I hope it helps you to understand how to achieve multiple inheritance in c# using interface.